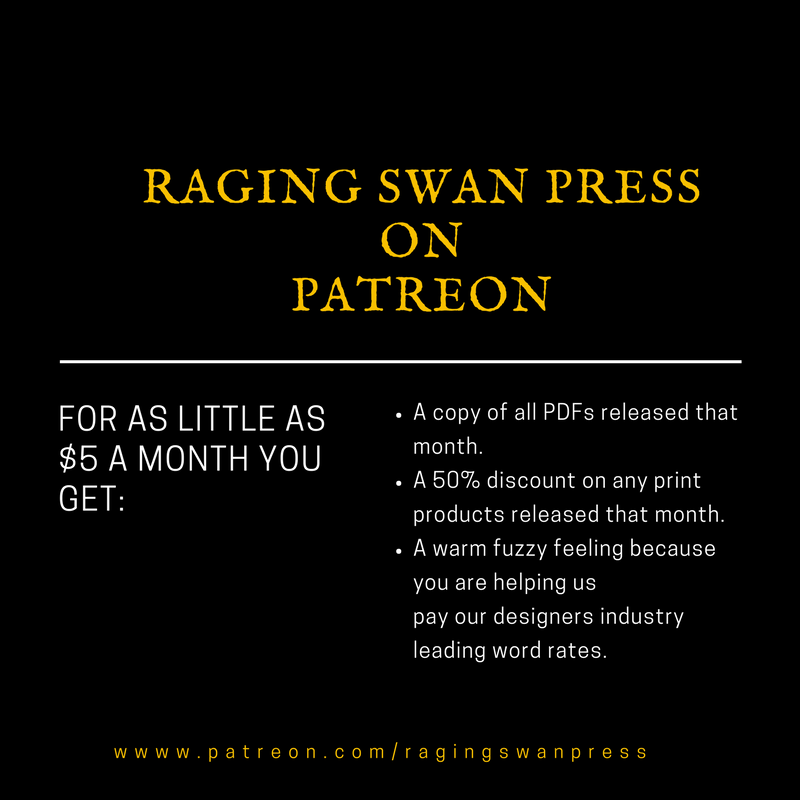 This isn’t a post designed to boastfully tell you about Raging Swan’s amazing sales. Rather, I thought this was a great opportunity to highlight a couple of things about 3PP (third party publishing)—namely sales figures and margins. Raging Swan Press is one of the most established 3PP Pathfinder publishers. We’ve been around for eight years next month. Thus, we’ve built up a following. We publish products designed for GMs not players so this limits our potential customer base (as there are far more players than GMs). I think this highlights the small sales figures most 3PP releases garner. It’s long been a truism in the industry that if a product reaches 200 sales, you’ve got a hit on your hands. To me, this highlights the need to understand your customers’ wants and desires while keeping in mind each product’s breakeven point (perhaps one of the most important numbers a publisher can understand). Knowing a product’s breakeven point helps you can control costs and anticipate likely revenue and profit for a book. For more about the breakeven point check out this article. I’m not sharing these figures to dissuade you from publishing your own material. 3PP can be a tremendously rewarding experience. I still get a buzz knowing Raging Swan’s books are used all over the world at thousands of gaming tables. Rather, if you are thinking of going into 3PP I’m keen for you to have realistic expectations about your potential sales (and therefore profit). An important lesson from these sales figures for me is the importance of Raging Swan’s Patreon campaign, which has been our epic, standout success of the last few years. Our (at time of writing) 331 patrons’ ongoing support—remember 200 sales is a hit in our industry—has enabled me to go from paying designers 1 cent a word to 11 cents a word, an excellent rate of pay for excellent work, while not going bankrupt! I thought you might find this post interesting as it pulls back the veil of 3PP and provides a small snapshot of actual sales. What do you think? Are you surprised it takes such a small number of sales to hit the top ten list? Is it about right? Let me know, in the comments below. Yes, it is surprised me that it takes such a small number of sales to hit the top ten list. However, I don’t think that the – if a product reaches 200 sales, you’ve got a hit – statement is true. My first ever encounter with Raging Swan Press was not long ago. It was during the Drive Thru RPG Xmas sale. I started to listen to the Glass Cannon Podcast, and I wanted to try out the game, so I purchased the Pathfinder themed Xmas bundle. That time I didn’t know anything about Raging Swan products, but it seemed like a great deal because I was in search of an excellent low-level Pathfinder adventure. The bundle contained the Retribution Collector’s Edition adventure. That was the main reason behind my purchase. Because of that purchase, I also discovered this blog, and I started to read all of the Gaming and GM advice type of posts. What I found on these pages is the most valuable content that I have ever read on similar forums or sites. Meanwhile, I began a Zweihander homebrew adventure with my group, and I also started to read the Pathfinder core rulebook. Sadly, Pathfinder was a bit let down for me because of the rule-heavy base system. So I was there with quite a few Pathfinder content without the intention to play that system. But it wasn’t a problem for me. I thought I would be able to use elements from that excellent content that I already had in my Zweihander adventures. Thanks to the high-quality content on this blog I became a patron in February. Besides the monthly free books, I also purchased some SNE supplements, like the Dulwich town backdrop and the Gloamhold campaign guide. I can’t wait to GM some adventures in Gloamhold, that megadungeon is brilliant. I think real success is what is based on this kind of relationship. I started to read your content, recognised its value and became a supporter. I’m pleased with my choice and glad that you can now pay more for your designers. Thank you for your kind word and your support over at Patreon, Attila. I much appreciate both and am delighted that you’ve found our products so useful. I hope they enhance your campaign! Saw it, and I’m following those session summaries. Congratulation on continued success. Maybe it will snowball a bit. Nope–I don’t pay for those. 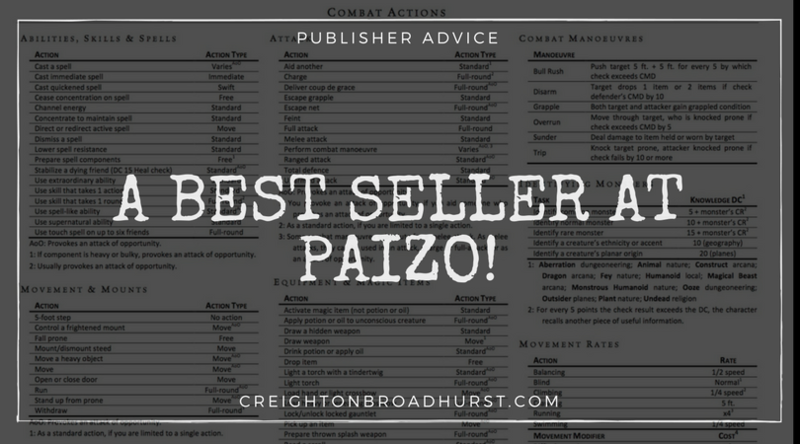 I think someone at Paizo picks what they think looks good! Congratulations on the milestone Creighton! Not surprised by the numbers, because there seems to be a glut of gaming products available these days. From Pathfinder to Starfinder, D&D, the board game renaissance, it’s a good time to be a gamer. Keep up the good work. I also am not playing anything D&D-related right now, focusing on a Horror on the Orient Express CoC campaign, but I still enjoy reading your posts and seeing your releases each month. Good stuff! Know that your products help make my game better nearly every two weeks when we play. I launched my campaign over two years ago by playing Retribution to get things rolling. Most recently, my players were retreating from stumbling into a Drow city by sneaking out an old Purple Worm tunnel. Consulting my Caves and Caverns book to make it slightly more interesting, I added the discovery of a chalk-drawn web compass that was off from what the players knew to be north. Simple. Single dice roll. Just a pinch of flavor. And my group was off and running! Why was it drawn? Why here? Do the Drow use this tunnel? Why is it wrong? It was delicious. So, you should know you make impacts, small and large, in my game all the time. Your products are fantastic! Very cool. I love hearing about people using our products at the table and–obviously–I’m delighted you started your campaign with Retribution! That’s awesome!